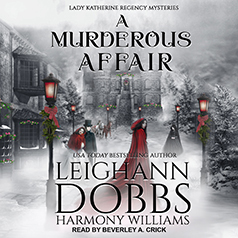 Lady Katherine juggles Christmas festivities, a perplexing cold case, and a wager with the annoying Captain Wayland that will prove once and for all which of them is the better detective. With her Bow Street Runner friend Lyle acting as a neutral party, Katherine teams up with her friend Prudence Burwick, her maid Harriett, and of course her pug Emma. Wayland has the aid of Pru's fiancé Lord Annandale and his valet McTavish. The two teams race against each other in a hunt for clues that takes them through the servants' quarters, stables, and seedy underbelly of London in search of a dangerous killer who thinks they got away with murder. Will the best men . . . or women . . . win?